captured by the raid would allow Brown and his followers to establish a stronghold in the near-by mountains from which they could attack slaveholders and draw liberated slaves into their ranks. Brown's raid attained initial success. Slashing the telegraph wires to cut off the town from the outside world, the raiders captured the local armory, arsenal and rifle manufacturing plant. They then rounded up 60 townspeople as hostages. Unfortunately, the raiders were unsuccessful in their attempt to isolate the town. A B&O Railroad train was detained as it passed through, but allowed to continue on its journey to Baltimore. Once it reached its destination, the alarm was raised and federal troops sent to the rescue. In the meantime, the local militia surrounded the town preventing the raiders' escape. Realizing his predicament, John Brown led his men, along with nine hostages, to the small fire engine house adjacent to the armory. Federal forces arrived on Monday evening and successfully stormed the stronghold the following day, seriously wounding Brown. He was tried and convicted of treason against the Commonwealth of Virginia. Just before his hanging on December 2, 1859, Brown uttered a prophetic forewarning of the coming Civil War: "I, John Brown, am now quite certain that the crimes of this guilty land will never be purged away but with blood." 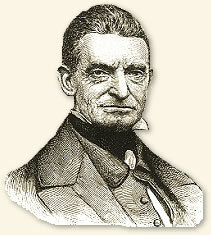 John Brown's raid and subsequent trial inflamed the dispute between the country's abolitionist and pro-slavery factions hardening the lines that separated the North and the South. "I determined to summon the insurgents to surrender... I did not expect it would be accepted." "...on arriving here on the night of the 17th instant,I learned that a party of insurgents, about 11pm on the 16th, had seized the watchmen stationed at the armory, arsenal, rifle factory, and bridge across the Potomac, and taken possession of those points. They then dispatched six men, under one of their party, called Captain Aaron C.V. Stevens, to arrest the principal citizens in the neighborhood and incite the Negroes to join in the insurrection. The party took Colonel L. W. Washington (the great-grand-nephew of George Washington) from his bed about 1 1/2 am on the 17th, and brought him, with four of his servants, to this place. Mr. J. H. Allstadt and six of his servants were in the same manner seized about 3 am, and arms placed in the hands of the Negroes. I determined to summon the insurgents to surrender. As soon after daylight as the arrangements were made Lieutenant J. E. B. Stewart, 1st cavalry, who had accompanied me from Washington as staff officer, was dispatched, under a flag, with a written summons... Knowing the character of the leader of the insurgents, I did not expect it would be accepted. 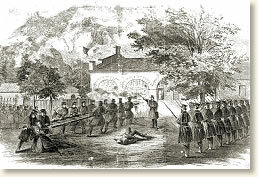 I had therefore directed that the volunteer troops, under their respective commanders, should be paraded on the lines assigned them outside the armory, and had prepared a storming party of twelve marines, under their commander, Lieutenant Green, and had placed them close to the engine house, and secure from its fire. Three marines were furnished with sledge-hammers to break in the doors, and the men were instructed how to distinguish our citizens from the insurgents; to attack with the bayonet and not to injure the blacks detained in custody unless they resisted." Lieutenant Stewart was also directed not to receive from the insurgents any counter propositions. If they accepted the terms offered, they must immediately deliver up their arms and release their prisoners. If they did not, he must, on leaving the engine-house, give me the signal. My object was, with a view of saving our citizens, to have as short an interval as possible between the summons and attack. The summons, as I had anticipated, was rejected. At the concerted signal the storming party moved quickly to the door and commenced the attack. The fire engines within the house had been placed by the besieged close to the doors. The doors were fastened by ropes, the spring of which prevented their being broken by the blows of the hammers. The men were therefore ordered to drop the hammers, and, with a portion of the reserve, to use as a battering-ram a heavy ladder, with which they dashed in a part of the door and gave admittance to the storming party. From the information derived from the papers found upon the persons and among the baggage of the insurgents, and the statement of those now in custody, it appears that the party consisted of nineteen men - fourteen white and five black. That they were headed by John Brown, of some notoriety in Kansas, who in June last located himself in Maryland, at the Kennedy farm, where he has been engaged in preparing to capture the United States works at Harper's Ferry. He avows that his object was the liberation of the slaves of Virginia, and of the whole South; and acknowledges that he has been disappointed in his expectations of aid from the black as well as white population, both in the Southern and Northern States. The blacks whom he forced from their homes in this neighborhood, as far as I could learn, gave him no voluntary assistance� The result proves that the plan was the attempt of a fanatic or madman, which could only end in failure; and its temporary success was owing to the panic and confusion he succeeded in creating by magnifying his numbers." Robert E. Lee's account appears in: Hart, Albert B., American History Told by Contemporaries vol.4 (1928); Furnas, J.C. The Road to Harper's Ferry (1961); Nelson, Truman John, The Old Man: John Brown at Harper's Ferry (1973). "John Brown's Raid, 1859" EyeWitness to History, www.eyewitnesstohistory.com (2004).